Diamond Bar is a painting by K Henderson which was uploaded on July 17th, 2010. 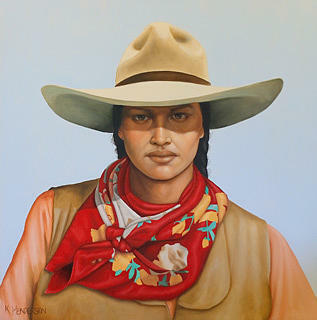 This is from my series of Cowgirls that I named after ranches. If you look closely at her earrings, one is a diamond and the other is a bar. Congratulations! Your work has been chosen to be featured on the Home Page of the Tribes Group! Great painting K, really well done, the scarf is great and the shadow across her eyes. One of those that you just want to keep looking at for a while.